The leaves of Alstonia scholaris (L.) R. Br. (Apocynaceae) have been historically used in “dai” ethnopharmacy to treat chronic respiratory diseases in the Yunnan Province PR China and first recorded on the Prattra-leaf lection. Prof. LUO Xiaodong’s team at Kunming Institute of Botany, Chinese Academy of Sciences (KIB/CAS) focused on their structures, bioactivities as well as new drug R&D from Alstonia alkaloids (AA) for more than 10 years. Based on the traditional use of A. scholaris leaves, SHANG Jianhua first reported that AA significantly inhibited animals’ frequency of cough and increased latent period of cough. Besides, AA increased delitescence of convulsion, and tumble of guinea pigs in anti-asthmatic test, and enhanced tracheal phenol red output in expectorant evaluation (Journal of Ethnopharmacology, 2010, 129, 293). Furthermore, AA may produce the anti-inflammatory and analgesic effect in vivo and vitro which possibly related to the inhibition of nitric oxide and cyclooxygenase (Journal of Ethnopharmacology, 2010, 129, 174). In collaboration with Prof. BAI Gang of Nankai University, it was found that the antiasthmatic effect of AA may be related to the inhibition of extracellular calcium influx, internal calcium release and protein kinase C (PKC) signal transduction system in smooth muscle cells. The antiasthmatic effect may be achieved by stimulating β2-adrenergic receptor (Journal of Chromatography A, 2012, 1227, 203). In addition, it was found that the effect of AA has multiple targets and was a double inhibitor of Cox-2/5-Lox, NF-kB, and a β2-adrenergic receptor agonist (Journal of ChromatographyB, 2012, 908, 98.). Additionally, ZHAO Yunli found that AA could effectively prevent neutrophils from accumulating into the airway, inhibit the excessive activation of alveolar macrophages, and reduce the infiltration of inflammatory cells by inhibiting the production of inflammatory cytokines TNF- and IL-8 and increasing SOD and NO level on the model of lipopolysaccharide (LPS)-induced airway inflammation (Journal of Ethnopharmacology, 2016, 178, 258). In addition, it was found that AA could reduce the number of eosinophils and the levels of IgE and eotaxin, to block the Th2 cytokines of the innate immune response on the model of asthmatic mice (Phytomedicine, 2017, 27, 63). In collaboration with Prof. YE Min of Peking University, the research found that the time-blood curve of AA fit the two-compartment model, and exihibit a dose-dependent manner; several prototypes and metabolites were detected in serum, urine and faeces. Among them, demethylation and dehydrogenation after monohydroxylation, monohydroxyl oxidation and further glucuronic acid are the main metabolic pathways (Journal of Chromatography B, 2016, 1026, 43). There is no special medicine for post-infection cough due to the complexity of the etiology and montelukast is ineffective. 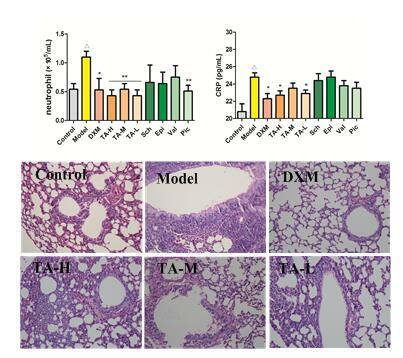 ZHAO Yunli also found that AA could attenuate the symptoms of cough in mice model through reducing white blood cells and neutrophils, ameliorating the pathological damage of lung as well as improving the items of interlukin-6, C-Reactive Protein, malondialdehyd and superoxide dismutase (Journal of Ethnopharmacology, 2018, 218, 69). This series of studies on the pharmacological effects of AA provide further support for its clinical application and the choice of optimal dose. This work was supported by the Ministry of Science and Technology of China (2013ZX09102113, 2014ZX09301307-003).